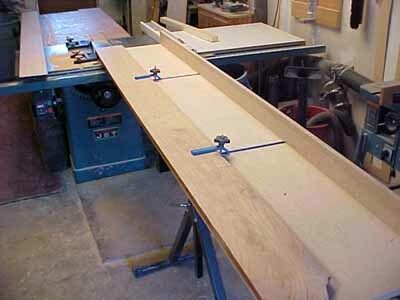 I've seen a number of jigs woodworkers have built to put a straight edge on a board so I thought I'd post a few pictures of my version. 3' piece of t-track from Rocklers. and can handle pretty much any size board you can clamp on it. Works great. only as heavy as 1/2 sheet of 3/4" plywood so it's not too bad. 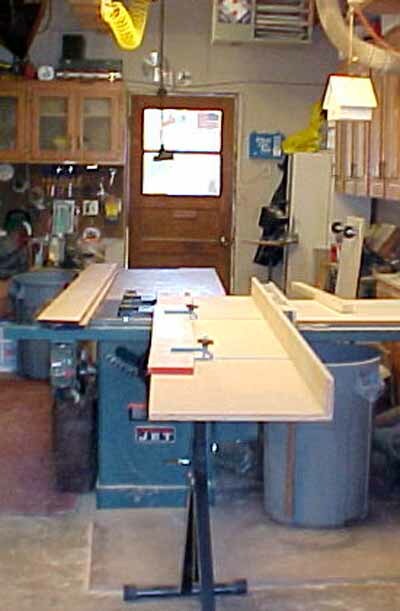 Once the sleds on the table saw and the roller there's no weight at all. no knicks in the straight edge. 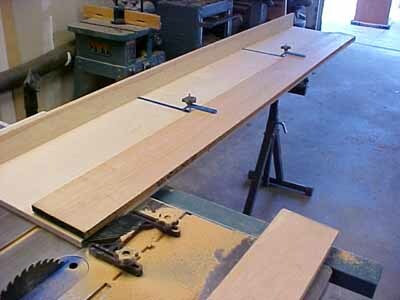 I don't have a guide in the miter slot cause I'd have to make an 8' dado in my outfeed table. They really help keep the jig stable and up against the fence. I tried it a few times without them and I wasn't very happy with the results. another 3" from the back. I've found that boards have a tendancy to "chatter" when they're not held down properly. plywood and rests on top of the main sled. countersinking the screws so they wouldn't interfere with sliding on the table top. 4' long (8' is a little long for me). Do you think that would work OK? depends on the length of the board your going to try and put a straight edge on. I buy all my lumber rough cut and mill it down to size. which in turn can ding up an edge. So anything hanging over the end of the jig just might need a little extra touchup on a jointer afterwards. OK with you if I add this jig to my collection? I PM'd you. But ya, I'd be honored to have my jig in your collection.